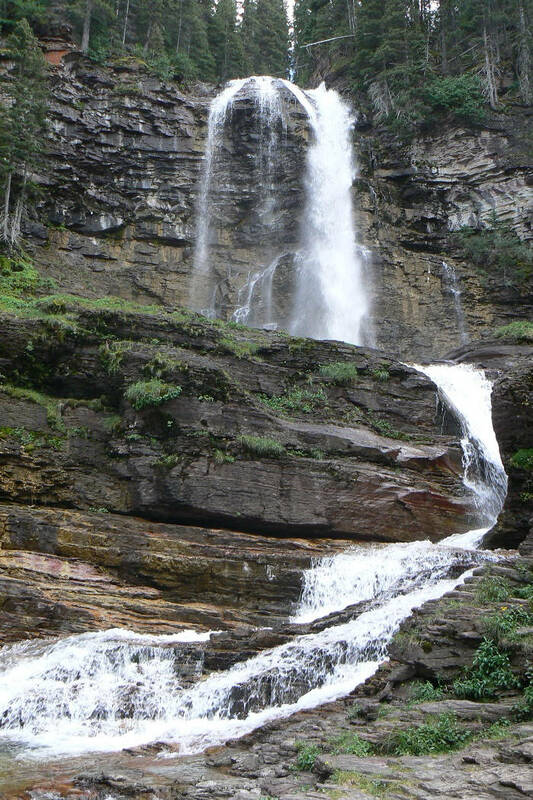 This in 1 of 2 handicap accessible Glacier National Park day hikes. The Trail of the Cedars trail-head is located 5½ miles east of Lake McDonald Lodge along the Going-to-the-Sun Rd. The first ½ mile along the east bank of Avalanche Creek is a raised boardwalk that passes through a forest of western hemlocks, black cottonwoods, and red cedars. Some of these trees are over 500 years old and have trunks 4-7 feet in diameter. You can stop and read about the flora and fauna of this ancient forest and or stop and rest on one of the benches along the way. At the end of the boardwalk, you will encounter a foot bridge across Avalanche Creek, at the base of Avalanche Creek Gorge – the highlight of the trail. 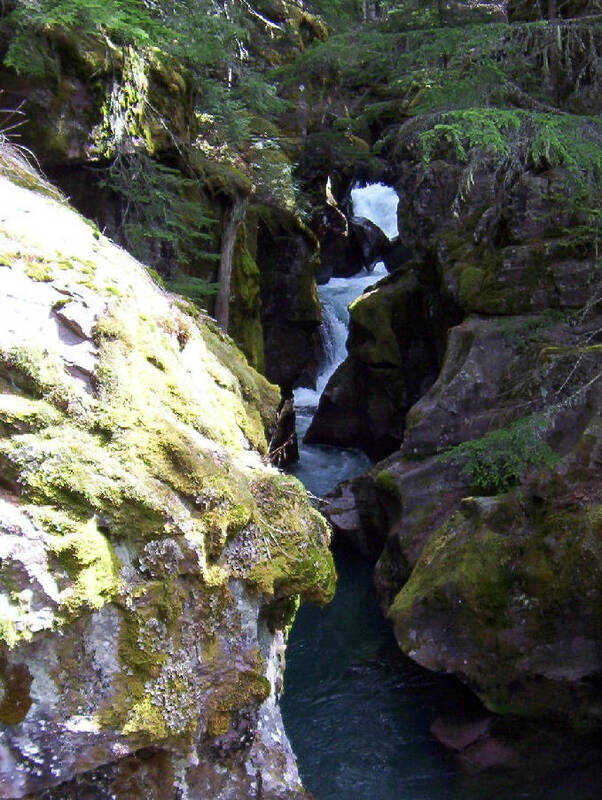 The force of Avalanche Creek cutting through the rock has formed numerous bowls and chutes. After crossing the bridge, the trail is paved and passes along the western edge of Avalanche Creek looping back to the trail-head. If you’re looking for a little longer hike, you can pick up the Avalanche Lake trail just west of Avalanche Creek Gorge. Avalanche Lake Trail, a very popular Glacier National Park day hike, is moderately easy hike with only 600-foot elevation gain over 2 miles. It starts off as the Trail of the Cedars and half way around the loop trail is an intersection with the Avalanche Lake Trail. After an initial fairly steep climb, the trail follows along the Avalanche Creek Gorge through a hemlock forest. You can see the power of this creek as it rushes through the rocks and continues to erode the landscape, creating very unique bowls and chutes. You can see water ouzels diving into the rushing waters and doing “pushups” on the rocks. As you look into the gorge, ensure you don’t get too close to the edge of the creek and on the wet, slippery rocks, one slip could be fatal. At roughly the 1-mile point, the trail departs from the creek side and athough you cannot see the creek you can still hear it rushing down the creek bed. As you continue along the trail you will intersect with Hidden Creek and encounter many down trees – the result of avalanches off Mount Cannon. Just before you reach the foot of Avalanche Lake, you will pass through tall, dense underbrush with no evidence the lake is just around the corner, and then suddenly, comes into view. Avalanche Lake sits in a box canyon with steep cliffs on 3 sides. Bearhat Mountain forms the east wall, Little Matterhorn the south wall, and Mount Brown the west wall. You can see several 100-foot waterfalls cascading down these steep cliffs and flowing into the lake. There is a nice beach at the foot of the lake with benches where you can sit and relax and enjoy the scenic mountain lake, or wade into its cool clear waters. You can continue along the western shore of the lake to the inlet where there’s reasonably good fishing – mostly cutthroat trout. Looking north, you’ll get a beautifully framed view of Heaven’s Peak. It is fairly common to see deer along this trail, as well infrequent black bear sightings. This is a moderately easy hike with a 500-foot elevation gain over 1½ miles to Hidden Lake Overlook. You pick up the trail head just behind the Logan Pass Visitor Center. 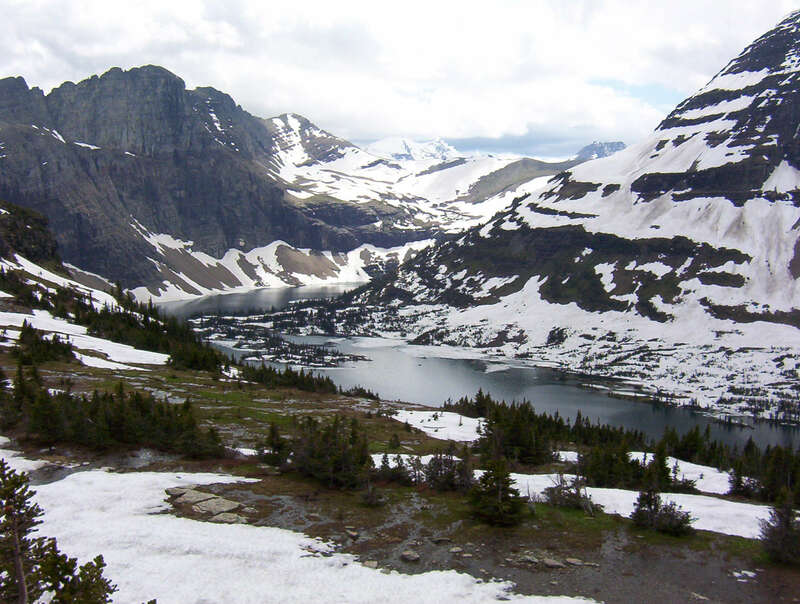 Because this a very popular Glacier National Park day hike, you will want to start your hike early in the morning to avoid the crowds. There is also limited parking at the Logan Pass Visitors Center so starting the hike early will also increase your odds of landing a parking spot. The first part of this trail is paved and then becomes a raised boardwalk with a series of stairs as you increase in elevation. It initially passes through an alpine meadow – the Hanging Gardens – full of wildflowers. Because of the high elevation of this hike, there will be patches of snow on this trail well into July. If you should hike it just after the snow has melted, tons of Glacier Lilies will be in bloom. After a ½ mile or so, the boardwalk will end and you will head southwesterly toward Hidden Lake Pass. Along the first part of this trail, you’ll have scenic views of Mt Clements and Mt Oberlin. As you continue on the trail, Mt Reynolds and Heavy Runner Mountain will be to your left, and just before you reach Hidden Lake Pass and cross the Continental Divide, there will be some ponds. Just past Hidden Lake Pass you will reach the Overlook, Bearhat Mountain will be towering above Hidden Lake and you’ll have wonderful panoramic views of the lake. If you desire a little longer hike, you can continue past the Overlook where the trail will descend 770 feet to the north shore of Hidden Lake. As you descend down to the lake, you will have great views of Mt Brown, Mt Stanton, and the upper portion of Lake McDonald. The trail becomes steeper as you near Hidden Lake and you will encounter a series of switchbacks. There is a small beach on the north shore of Hidden Lake, a great place to enjoy views of Bearhat Mountain and have lunch. 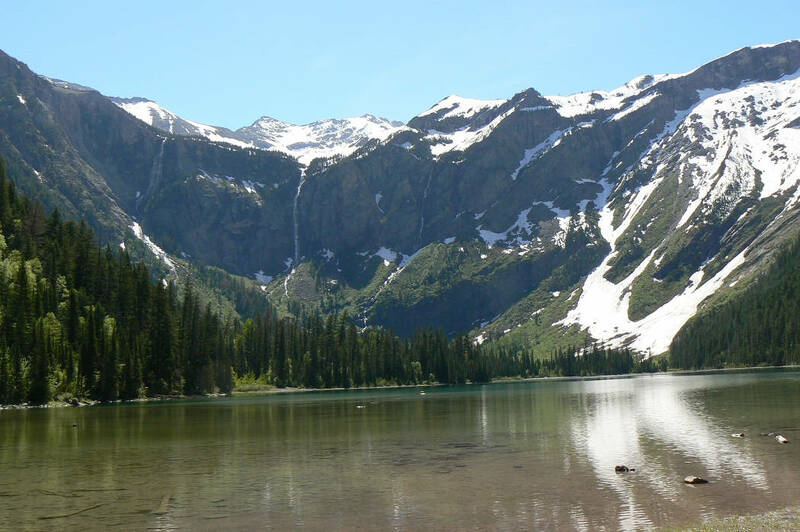 Hidden Lake is also renowned for its large cutthroat trout so bring your rod and reel and take on the challenge of trying to catch one of these wary trout. You can anticipate seeing a variety of wildlife along this trail. Mountain goats are a common site along with Colombian ground squirrels, golden mantels, and chipmunks. Bighorn sheep, marmots, and even wolverines can also be seen along this trail. This is the 2nd handicap accessible Glacier National Park day hike. It is also referred to as “Trick Falls”. 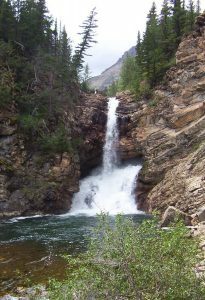 It acquired this nickname because in early summer the spring run-off raises the water level in the outlet stream between Two Medicine Lake and Lower Two Medicine Lake high enough that it rushes over a stone ledge into the stream 40 feet below, hiding the lower falls. As the volume of water decreases, the upper falls dries up and the water flows into a sink hole and through a cave 20 feet below the upper ledge. The trail head for this hike is roughly 1 mile inside of the Two Medicine entrance station. It passes through an open forest of spruce and fir with lots of underbrush. The level path has a well maintained gravel surface. Just before you cross the stream, there is a view point of the falls with benches where you can relax and enjoy this scenic view. High above the falls you will see Rising Wolf Mountain. If you’re inclined, there is a foot bridge across the stream with a path on the other side. Along this rough, uneven, path there are several places to stop and enjoy different views of the falls, and will eventually lead you to the foot of the falls. We suggest you start this day hike at the Sunrift Gorge, located roughly 10 miles west of the Saint Mary Entrance. You’ll pick up the trail head for the Saint Mary Falls/Virginia Falls Trail just east of the bridge over Baring Creek. It begins with steps down to Baring Creek and then continues down and follows Baring Creek for .3 miles where you’ll come to the Sun Point/Baring Falls trail junction. Take a right at this junction and in .1 miles you’ll come to a footbridge over Baring Creek. Just past the footbridge, you’ll see Baring Falls to your right. Baring Falls sits in a very scenic setting as it tumbles 25 feet down over rock ledges. As you continue along the trail past Baring Falls, you’ll move through the forest briefly and then emerge at the edge of Saint Mary Lake. As you travel along this trail, you’ll have several views of Saint Mary Lake, Little Chief Mountain and Mahtotopa Mountain across from Saint Mary Lake. At one point, you’ll get a view of Saint Mary Lake (roughly 100 feet above the lake). 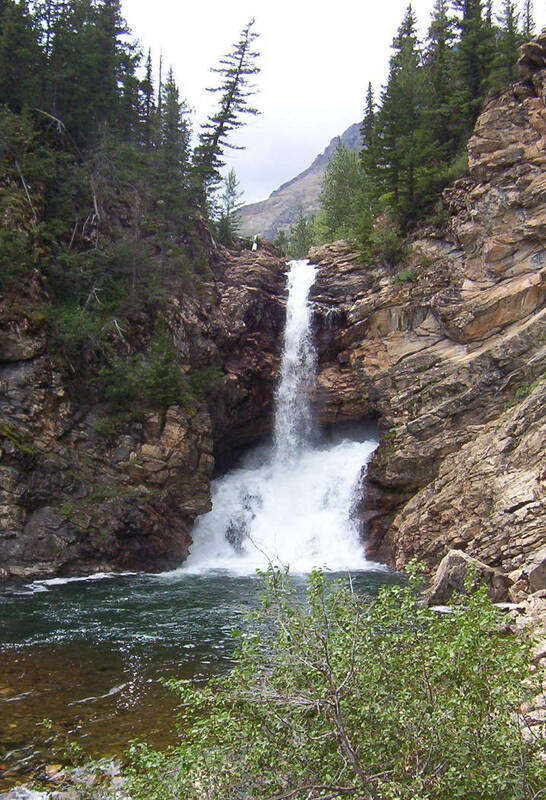 After about ½ mile, you’ll reach the junction with the Saint Mary Falls cutoff trail, take a left at this junction and in roughly ½ mile you’ll reach the Saint Mary River (a right instead will take you up to the Going-To-The-Sun Road). Here you’ll be able to hear the roar of the falls and shortly you’ll be on the footbridge crossing Saint Mary River at the base of Saint Mary Falls. Saint Mary Falls drops 35 feet in 3 tiers with the first 2 tiers being the most spectacular. As you stand on the bridge, you can feel the cool mist from the roaring water falls below, it is one of the more photogenic falls in Glacier Park. further up the trail and you’ll encounter the second unnamed falls, also very impressive as it rushes over a series of tiers. And in another ¼ mile, you’ll reach one of the most impressive multi-tiered falls in Glacier Park – Virginia Falls. You can cross the footbridge over Virginia Creek to get a better view. The main tier of Virginia Falls drops about 50 feet into a pool where it then continues to cascade down rock ledges into Virginia Creek. If you stand at the base of the main tier, you’ll be cooled by the blast of cool air and mist from the falls. 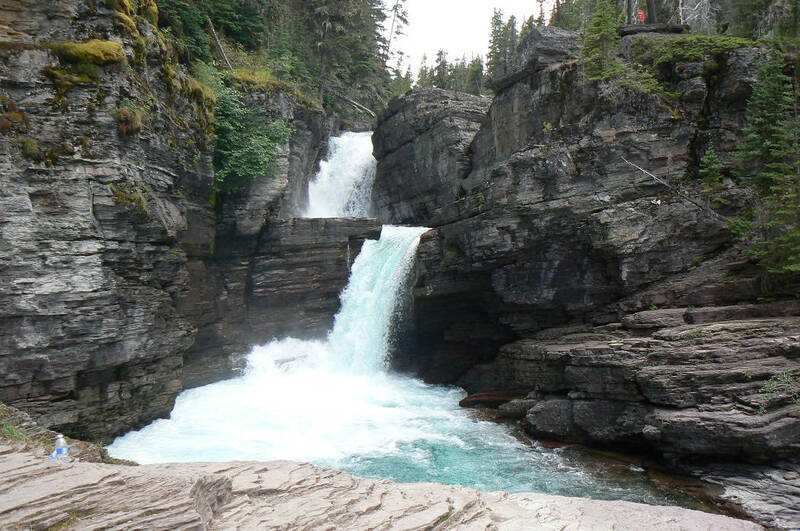 Because this is a short trail – about 5 miles round trip – and provides views of several impressive falls, it is one of the more popular Glacier National Park day hikes. This trail was drastically changed by the Reynolds Creek Fire in 2015 and should be available to hike commencing summer of 2016. It’s still a trail well worth hiking as portions of the trail are not in the burn area and you’ll still enjoy a series of scenic, gushing falls. The burn also reveals numerous mountain views. For information on some of our favorite longer day hikes, see our post Glacier National Day Hikes (Long Hikes).